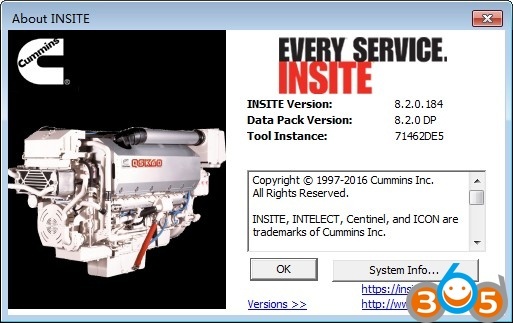 Free download Cummins INSITE 8.2 with installation and activation help to make it work with new and old inline 4/5/6/7 adapters. Here are two versions for you, one with free activation for 15-day trials only, the other with 500 times to use once activated. Copy code gives me free activation 15 trials. UNKNOWN SECURITY! You’re trying the free insite at your own risk! 6. Check the limit and enter the appropriate value. Unchecked is no limit. Here is the 100% tested version. You can use the Insite 8.2 pro or lite version with security and relief. You have 500 times for use once your insite is activated. Do not substitute cables, except as indicated in the INLINE 5, 6, or 7 Product Announcement Bulletin. Incompatible cables may damage the INLINE 5, 6, or 7 adapter or personal computer and will void warranty. Incompatible cables may cause communication issues with INSITE. INLINE 5, 6, and 7 adapters may intermittently lose communication. If your Datalink adapter has communication problems, disconnect power from the adapter for 5 seconds and then reconnect. The INSITE program does not need to be shutdown. 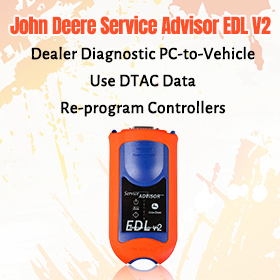 There is a feature under Tools > Reset Datalink Adapter that may correct some software communication errors with the INLINE 5, 6, and 7. The main harness (backbone) has a maximum overall length of 40 meters. A J1939 stub, which can be a connection point for ECM’s and/or the INLINE 5, 6, and 7 Datalink adapter, cannot exceed a maximum length of 1 meter. At each end of the backbone harness is a terminating resistor with a nominal resistance of 120 Ohms, it will measure 60 Ohms when you measure across the Datalink. The INLINE 5, 6, and 7 adapters should be connected to a continuous battery power supply. 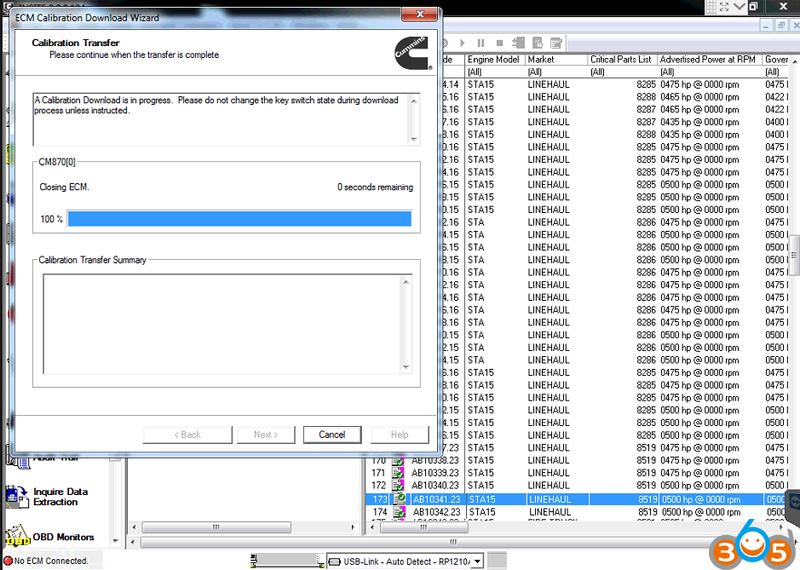 When making adjustments with INSITE, including calibration download, the operator will be asked to switch the key off. If the adapter is getting its power from a power source dependent on the key switch status, such as the lighter adapter inside the cab, the adapter will lose power, which will result in INSITE losing connection to the ECM. This will require the operator to reconnect to the ECM and the adjustments might not have been saved. Note: The INLINE 4 adapter is obsolete. It can be used with INSITE, but technical support for this adapter is no longer available. INSITE 8.2.0 takes longer to open if the computer has been restarted. Issue is currently under investigation. INSITE 8.2.0 does not support Windows® XP or Windows® Vista. INSITE version 8.2.0 will only operate on PC’s running either Windows® 7, Windows® 8 or Windows® 10. Error 5200: Indicates communication loss between computer and the datalink adapter. Error 5201: Indicates communication loss between the datalink adapter and the ECM. Error 5202: Indicates no communication could be established between the datalink adapter and the computer. Error 5204: Indicates no communication could be established between the datalink adapter and the ECM. If the “Auto Configure” and/or “Datalink Adapter Connection Test” do not find the adapter when connected, manually configure the Datalink adapter connection. 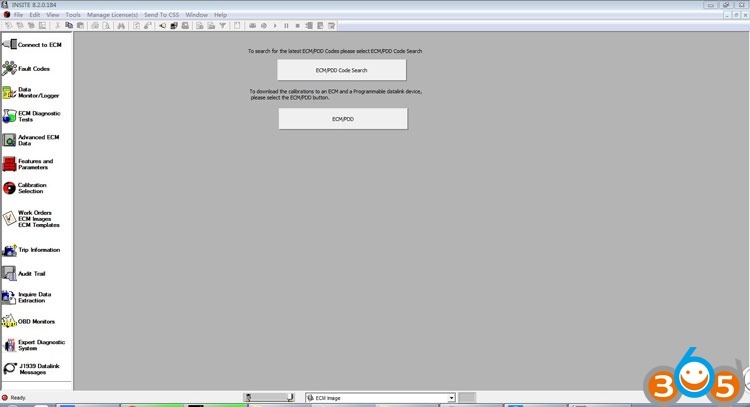 If the display becomes distorted or cannot be completely viewed, close the Advanced ECM Data window and then reopen it. Resizing the window can cause the view to become distorted. 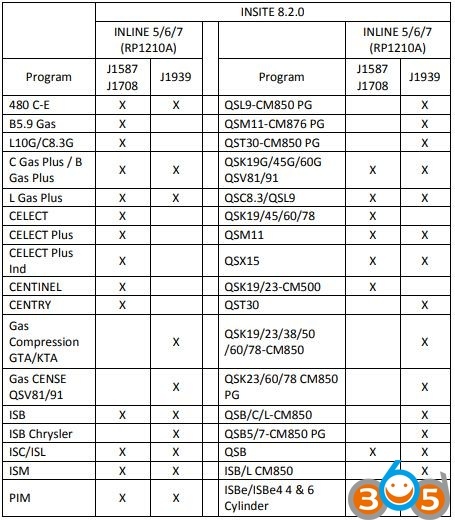 Automotive applications will have a default setting of “ON” for the Save and Restore option in the Calibration Download dialog. Industrial applications will have a Default Setting of “OFF” for the Save and Restore option in the Calibration Download dialog. When performing a Calibration Download, the “Save and Restore” option may be grayed out for some applications. 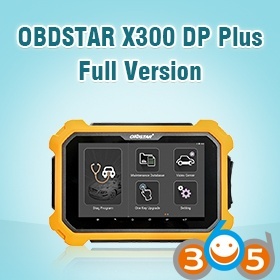 To decrease calibration download times, please insure that all applications other than INSITE are closed. Always use the J1939 protocol and engine connector when available. 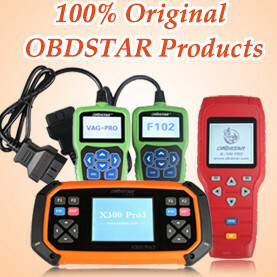 The use of Large Toolbar Buttons will not display all icons on the toolbar. Work Around: Under Tools > Options > General, select Small Buttons in Display Options. Dual Monitors are not supported by INSITE. To disable the “Display Feature Names” option for the view bar, uncheck the box in Tools > Options > General > Viewbar > Display Feature Names. If your PC monitor display is set to “Large Fonts”, some information in INSITE may not be displayed. It is recommended to use small fonts. 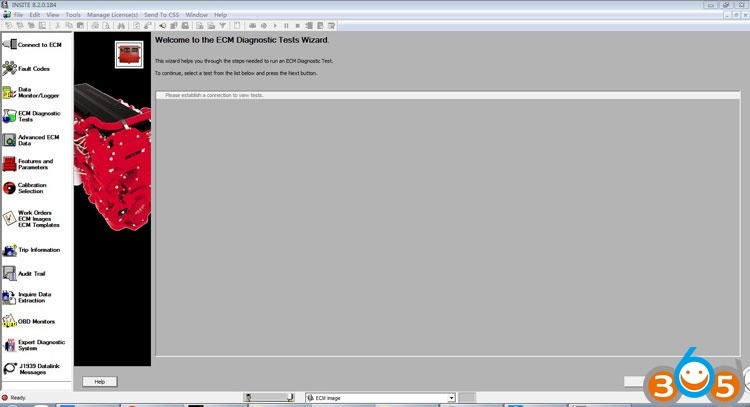 If the display becomes distorted or cannot be completely viewed, close the ECM Diagnostic Tests window and then reopen it. Resizing the window can cause the view to become distorted. The MIL Lamp Status is not displayed when printing the Image Fault Codes in Tool Display Format. Work Around: Print the Image Fault Codes in Text Only Format or connect to the image, open Fault Codes and select the Print icon. When using print preview, use the tool bar magnifying glass to display the text in a larger view. The Print options will be disabled when no printers are available. This includes the Page Setup, Print and Print Preview options. Work around: Setup/install a printer on the PC and retry the INSITE print selection. Values shown in simulator do not reflect real values that would be seen when connected to an engine. 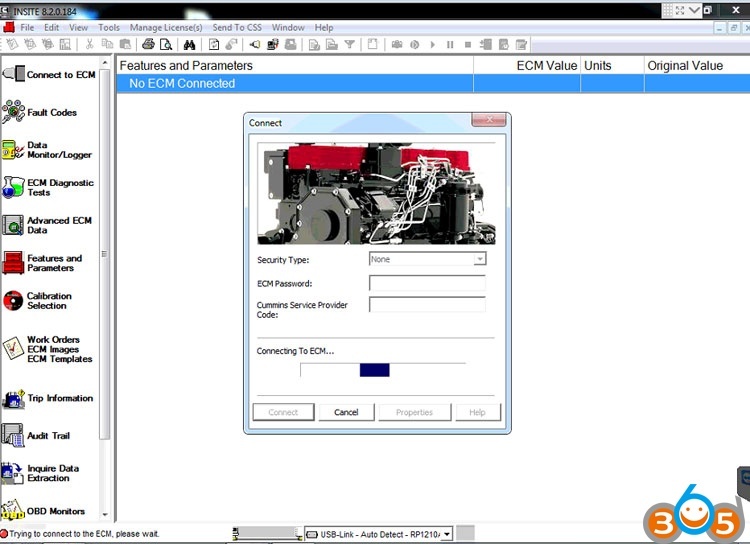 All simulators for the 2007 models and above were combined into one single simulator called INSITE Integrated Simulator – Single Module and INSITE Integrated Simulator – Multi-Module. 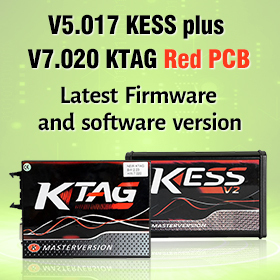 These will display all the Features and Parameters, ECM Diagnostic Tests, and Advanced ECM Data that is supported for single and multimodule engines. Alternatively, select the “Export All” from the right-click menu while highlighting any Image. When using templates, it is recommended to verify the first template sent to the target vehicle. 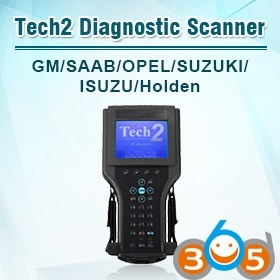 This helps ensure the template configuration is correct for subsequent vehicles. When using templates, verify that the ECM code is compatible or the same. When naming images and templates, special characters cannot be used (i.e. & ^, etc. ).